The "blockchain" makes it possible to manage information securely with a distributed, decentralized and synchronized registry and will be the main tool in the finance sector after 2020, according to Spanish experts. This data storage and data transmission technology, on which cryptocurrencies or digital currency are based, is a trend that is becoming "mainstream" in financial applications and, according to the founder of the Bitcoin Foundation, Jon Matonis, will be used "on a large scale" in the sector in 2020. 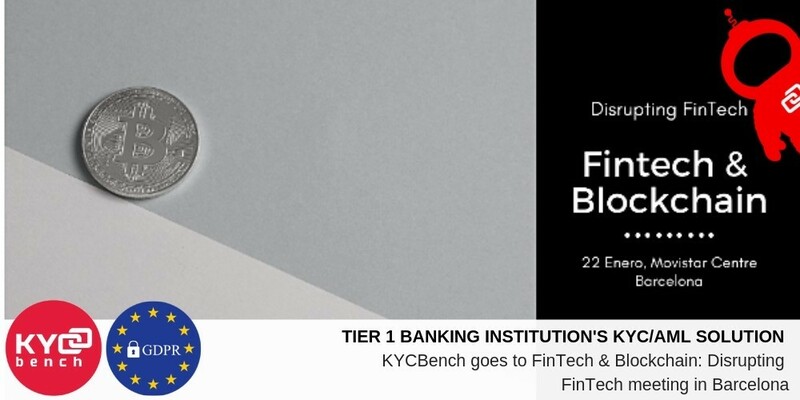 Last Tuesday, January 22, at the Movistar Center in Barcelona, KYCBench team visited FinTech & Blockchain: Disrupting FinTech meetup, organized by Blockchain Institute & Technology Barcelona. Eternity ambassador in Spain, Manel Ruiz, talked about the blockchain revolution on the finance sector and Pablo Ruiz, CEO of WallWings and Infinit and professor of Blockchain Institute & Technology updated on the latest innovation in blockchain and fintech. With the proliferation of financing systems through the internet, various fintech business models have been generated, the objective of which is to streamline the economic operations of companies. Fintech deals with companies that offer their customers innovative financial products and services, through the use of ICT technologies. That means that it unites technology and finance with the objective of creating financial services that are easy to hire, understand and with a standardized price that allows access to a greater number of people and companies, both investors and borrowers. The fintech, as the blockchain, are the most advanced companies. 77% of them foresee adopting it as part of their systems in two years and 90% of the payment means companies foresee adopting them for that same year. KYCBench again had a great opportunity to meet several companies, from financial institutions to large retail businesses, which are already working to implement Blockchain solutions to be pioneers of technological change and share our ideas with these experts while networking.